Blast-Off Girls: Jumping Young Teenieboppers! "Boojie Baker is a slimy, crooked manager of bad garage bands. He whores women, bribes record producers, and cheats his bands out of money. After getting the brush off from a band he’s managing, Boojie comes upon “The Big Blast.” He decides to make them the next big thing and blurts out his catch phrase, “Have a blast!” constantly. 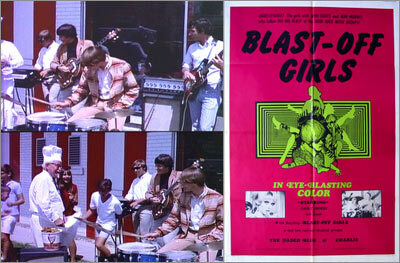 “The Big Blast” performs very badly produced garage pop-rock. A lot. They make it big and party. A lot. Not too much else happens." ...it sounds like the music industry can use someone like Boojie today! This page contains a single entry from the blog posted on February 25, 2008 12:26 AM. The previous post in this blog was Do the Lambretta Twist!. The next post in this blog is Taco Bite: Best Mex This Side of the BQE.